I'm sure like the rest of the country, you might be gearing up for the super bowl this weekend. 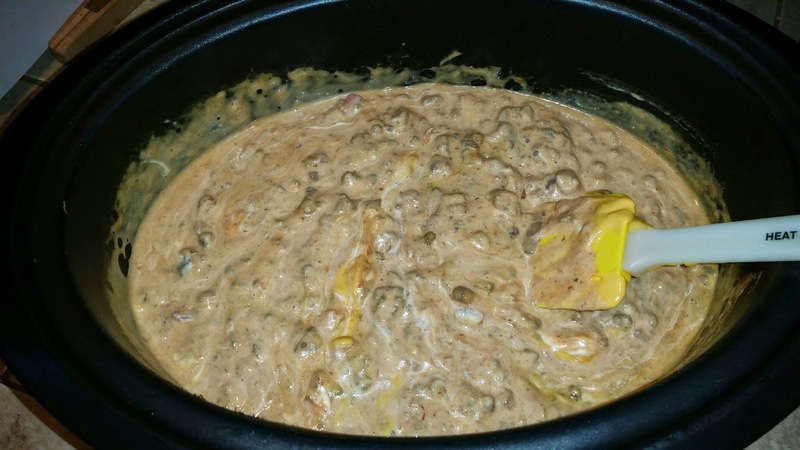 We tried a recipe over the New Years holiday that turned into a huge hit. It was easy, delicious, and I'm surprised to say not one, not two, but all THREE of my girls ending up loving this stuff! Matter of fact, if we are confessing our sins here, I actually ended up living off this dip for a few days. True. Story. But first, the dip! 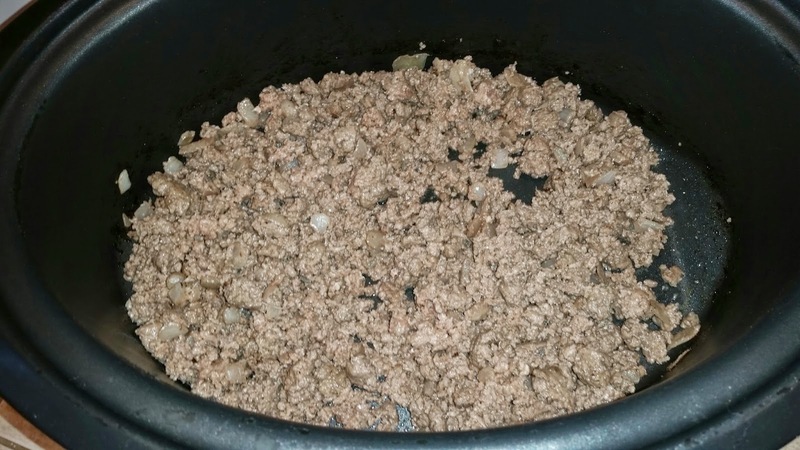 I dumped the 1 lb of hamburger meat in my roasting oven. It is infinitely better than a crock pot (see rant here) because it can go up to 400º and I ended up browning the meat in here. Hey, one less pan to dirty up is A-Okay in my book. 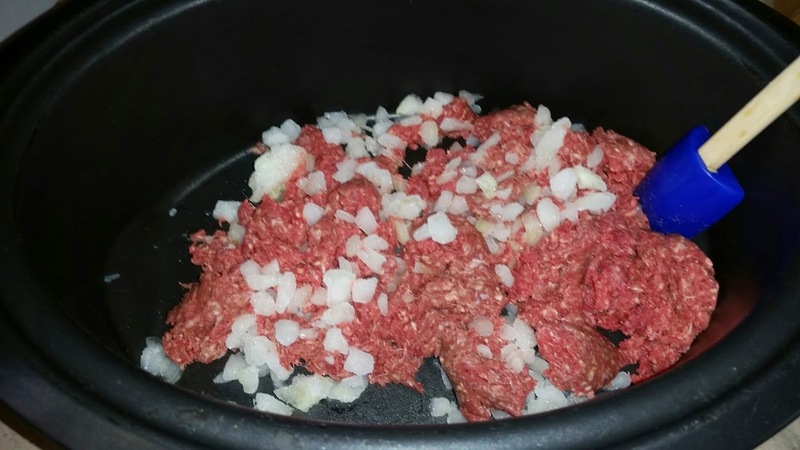 After browning (and draining if necessary) the meat and onions, add in your other ingredients, including the cheese, salsa, sour cream, re-fried beans, and salt and pepper to taste. Heat on low for a few hours until you are ready for your party. The original recipe said to heat on high for two hours, but I don't like to do that to recipes that have sour cream in them. Low and slow seemed to work just great. 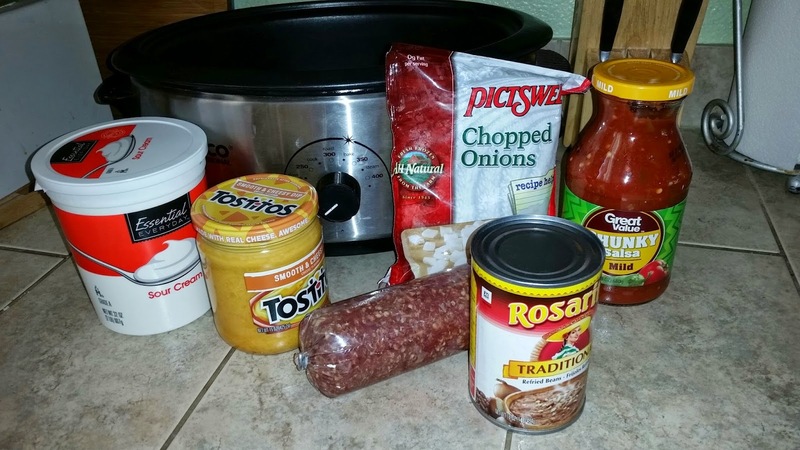 Beefy, cheesy, taco dip! Yum. Serve hot with hearty corn chips. Ones that can really hold up to meaningful dipping and not break, because this dip is rather substantial. Yum. 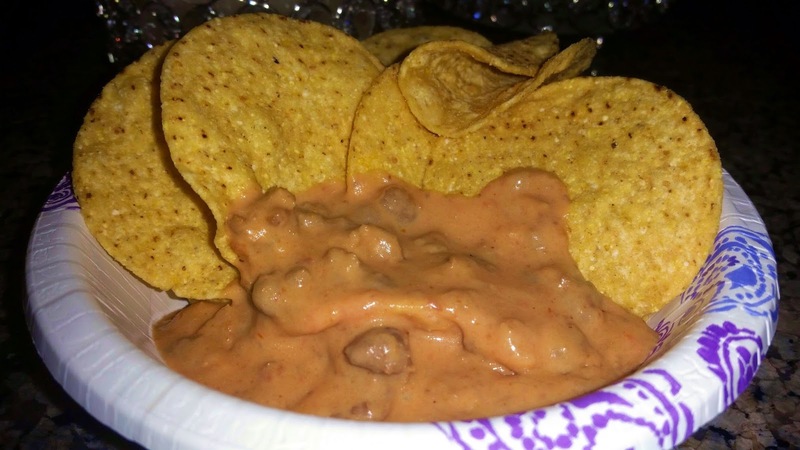 It was the perfect dip to ring in new years with. See our disco lights in the background? It was a Christmas gift from my parents. Besides this dip it turned out to be the other great thing about our sad little New Years celebration. Why sad? Oh yes, and now on to my story. Well I made a big ol' vat of this dip, then my hubby went and got the flu the day before New Years Eve, so we ended up not going anywhere, and he was quarantined upstairs. 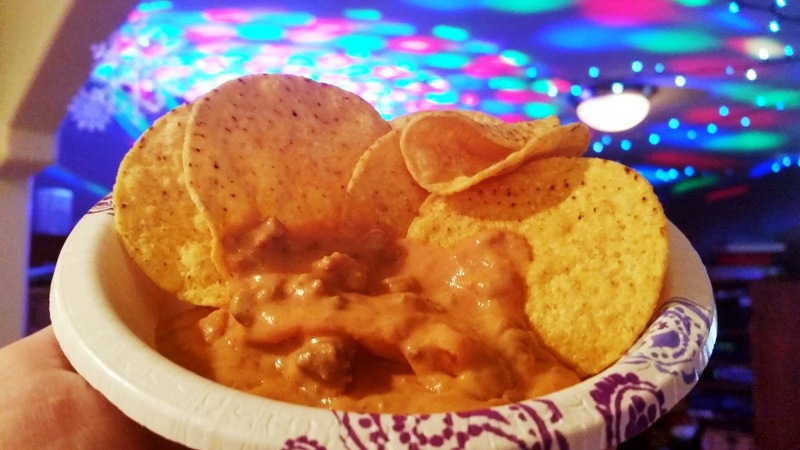 No body felt like cooking, (nobody, meaning me), and we had a ton of dip that everyone loved, so we ended up having this taco dip for New Year's Eve while the girls turned up the music and had a disco dance party to the colorful lights. That almost qualifies as a New Years Party, right? Then we had it for lunch the next day (their suggestion), a late night snack the later that night, and lunch the next day too. By the time January 2nd, rolled around, I realized we had survived on this dip the entire time. Hilarious. You'd think we would have been sick of it, but nope. I made it a few days later and took it to our after Christmas after Christmas party with extended family, which they loved as well. My pickiest eater says she wants it for her birthday meal with corn on the cob and watermelon (high praise if it made it on to her birthday menu). One other thing, it is easy to spice this thing up. Our recipe was very mild for the small fry (okay and for me, the zero star Thai girl). 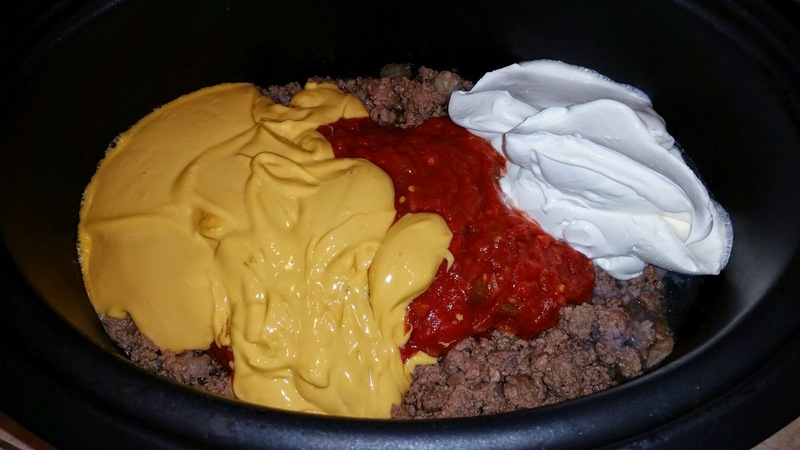 Just add medium or hot salsa instead of mild, add medium queso cheese instead of mild cheese dip, spicy sausage, and add any other spicy things like green chiles or hot sauce to the mix. This is a great, hearty dip you can bring to any occasion. Enjoy!